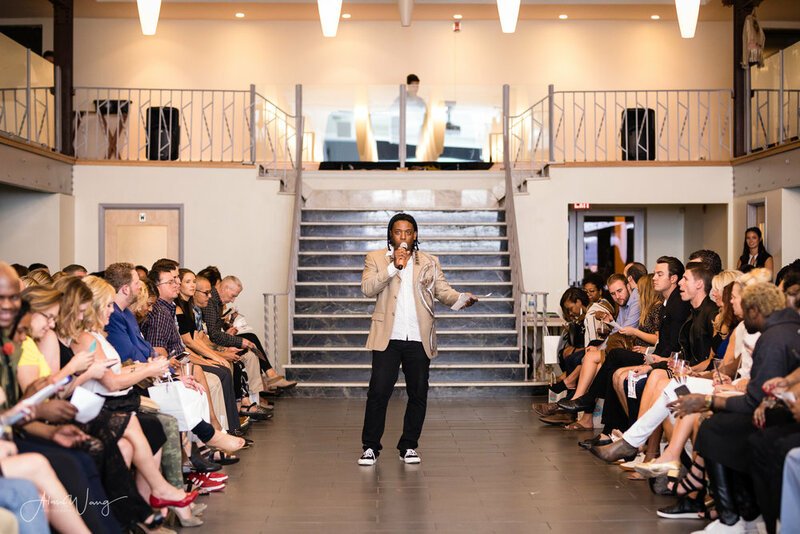 After thanking Pins and Needles sponsors, last-minute donors, and Mother Model Management; he introduced Charles Smith II and the Top 10 Emerging designers to the public of St. Louis. 4 of those Top 10 designers did not make it to the top 6, but they presented their designs on the stairs since the doors opened until the show started. Flashing lights were the only thing illuminating the venue, during Charles Smith II dramatic opening with 23 looks. 2. First of the 6, Carl Mackey. The first emerging designer to present his collection was Chicago native Carl Mackey; who described the whole experience as “surreal” and was surprised to see the significant amount of Pins and Needles attendants. 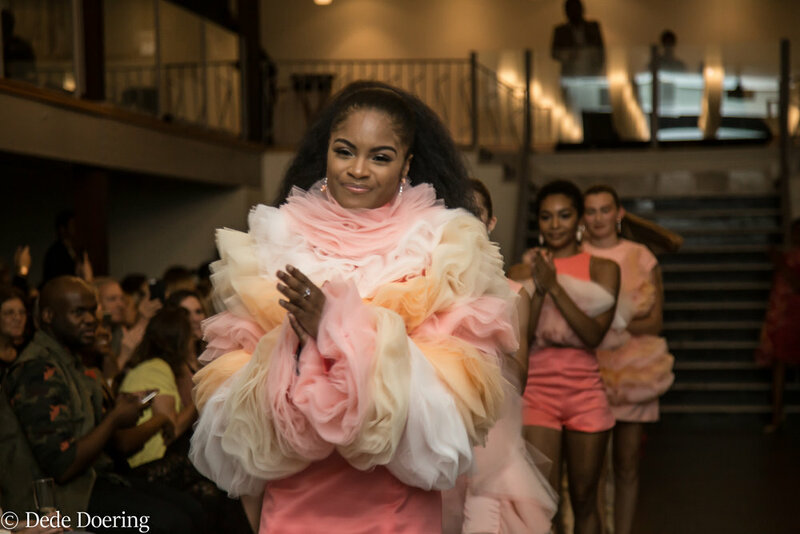 “It’s exciting to see what fashion is like here in St. Louis and seeing some of the people coming in the show and I was like ‘This is a little pretty fashion forward city, who knew? !’” Carl said. 3. It's the winners' turn. St. Louis native Chicago based designer Hailey Washington went next. Pins and Needles was the first opportunity she got to show her hometown what she’s learned throughout the years living in St. Louis and Chicago. “I’m excited to contribute something to St. Louis because this is my first time presenting at home, so to me like in a way my graduation ceremony; showing St. Louis everything that I’ve learned everywhere else and bring it back home.” Hailey said. Last but not least Washington DC based designer Amanda Casarez stole the audience’s attention with her bold and unapologetic designs. Amanda sensed a bigger fashion environment in St. Louis, compared to DC. “We’re trying to get fashion going there but it’s not quite where I believe it should be and there isn’t as many fashion events as I would like”, Casarez said. 5. A moment of love and freedom brought by MTHREEPROJECT. Next collection brought by Marcel Coleman Jr. stopped time and place when he broke the classic runway rule and instead brought to life a heart-warming live dance performance that was very well received and clapped by the people of St. Louis “This is a ‘freeing ourselves’,” Marcel said. The evening closed with the announcement of both winners of the night, Kat Gaume for the Grand Prize Winner and Raven Pulliam for the People’s Choice Award. All the emerging 6 met their networking and exposure expectations in the St. Louis fashion scene, allowing them to connect with bloggers, photographers, fellow designers, clients, etc. “Thankful for It's a great event for designers fresh out of school. I hope Pins and Needles will keep running for many years!” Kat Gaume said.